Palestinian Authority's Ambassador to Libya confirms that PA forces armed under Oslo Accords played a major part in Second Intifada. 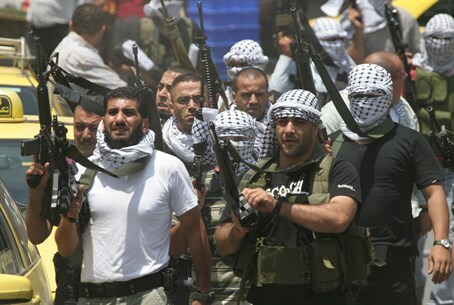 During the national debate in Israel over the controversial Oslo Accords of the early 1990s, many of the agreement's opponents warned that arming and training Palestinian Arab "security forces" - a key Israeli concession as part of the accords - would backfire, simply increasing the capabilities of terrorists to attack Israel. Oslo's supporters, however, countered that it would have the opposite effect, helping "moderate Palestinians" to reign in the more "extreme" factions. The outbreak of the "Second Intifada" - which saw many more Israelis murdered by better-armed terrorists than during previous waves of violence - has long been seen as a vindication of the former opinion, particularly by those on the Israeli right. And, it seems, turning the guns they received on their Israeli benefactors is a source of pride for Palestinian Authority officials. During a televised speech which featured on the pan-Arab Al Jazeera news network, translated by MEMRI (Middle East Media Research Institute), the PA's Ambassador to Libya, Mutawakkil Taha, boasted of the achievement, claiming that most terrorist attacks during the early days of the Second Intifada were carried out by members of the PA's own security forces. "Israel decided to gather the youth who had fought it in the first Intifada, and to organize them into security forces, showering them (with money), so that they would defend it, rather than Israel having to defend itself," he said, essentially summarizing the doctrine of the Israeli Left at the time. "But what really happened?" he asked, rhetorically; "When the 2000-2001 Intifada broke out, it turned out that 70% of the martyrs, who carried out attacks against the occupation, were members of the Palestinian security forces!" Just to make sure his audience grasped his message, he clarified: "In other words, even when (Israel) establishes (our) security forces, these security forces remain patriotic and continue to fight the occupation." Taha implied that the PA continued to maintain the same doctrine, adding that those same security forces "will continue to serve as a wall defending the Palestinian spirit and the Palestinian interests." Continued rhetoric glorifying anti-Israel violence and anti-Semitism by Palestinian Authority officials has been a key concern for Israel during the current round of negotiations between the sides. Israeli officials have long complained that, whereas they are regularly pressured to make goodwill gestures to the Palestinian Authority, no such gestures - including an end to incitement - are required of the PA in return.